Photo Caption A: Adam Rosen, PsyD, Director, Counseling and Wellness Services and ADA Coordinator, Berkeley College Student Development and Campus Life, Midtown Manhattan (far right); and Christopher Browne, Student Success Coordinator, Academic Advisement, Berkeley College, Brooklyn (bottom center), with students on a 5-mile hike at Bear Mountain State Park, as part of a series of outdoor events organized with the Berkeley College Office of Military and Veterans Affairs to promote wellness. 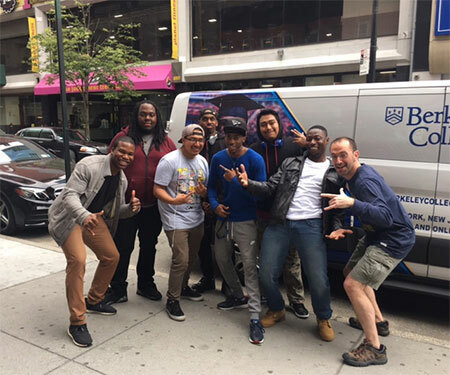 This summer, students from Berkeley College have been participating in “Summer Adventure Outings,” a series of outdoor events organized by the Berkeley College Office of Military and Veterans Affairs (OMVA), and the Office of Student Development and Campus Life (SDCL) in Midtown Manhattan. Inspired by a national outdoor adventure-training program offered by the Sierra Club, OMVA and SDCL collaborated to offer four summer Friday hikes to Berkeley College students. “At the heart of this outdoor adventure is the opportunity for students to experience the great outdoors, to build stronger bonds and a sense of camaraderie with one another, to develop a greater appreciation for their general health and well-being, and to explore more effective supportive outlets to integrate into their everyday lives,” said Adam Rosen, PsyD, Director, Counseling and Wellness Services and ADA Coordinator, Berkeley College Student Development and Campus Life, Midtown Manhattan. The first event held on May 12, 2017, was geared toward the student-veterans. The second adventure was held on June 16, 2017, and included students from Brooklyn, NY. The second adventure also was a 5-mile hike at Bear Mountain State Park. 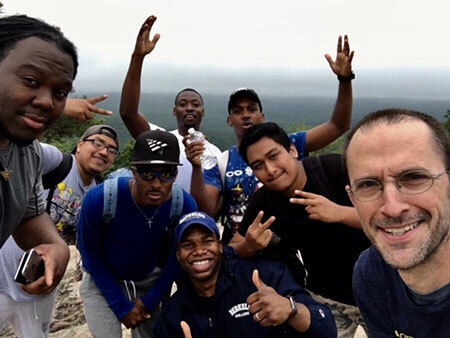 After taking in a mountaintop view of the Hudson Highlands and Harriman State Park from Perkins Memorial Tower, the students gathered for a 25-minute discussion on the importance of physical and emotional health. The students also addressed various gender-based themes and obstacles to personal care, support and development. “Men are often hesitant to reach out for support, so we encourage our male students to participate in these discussions on and off campus,” said Christopher Browne, Student Success Coordinator, Academic Advisement, Berkeley College, Brooklyn. Berkeley College student Oscar Blair came to the United States from Guyana a little more than a year ago. This was his first time hiking in the mountains. Photo Caption B: Students from Berkeley College in Brooklyn and Midtown Manhattan prepare for transportation to Bear Mountain State Park for 5-mile hike and discussions of health and wellness for men as part of the Summer Adventure Series offered through the Office of Military and Veterans Affairs, and Student Development and Campus Life Counseling and Wellness Services. Left to right: Christopher Browne, Student Success Coordinator, Academic Advisement, Berkeley College, Brooklyn; students Wallyson Fontaine, Eduardo Romero, Chris Bussey, Shaquan Trimmier, Fernando Aguilar, Oscar Blair, all of Brooklyn; and Adam Rosen., PsyD, Director, Counseling and Wellness Services and ADA Coordinator, Berkeley College Student Development and Campus Life, Midtown Manhattan.